MSU Bikes is the one-stop location for all of your bike repair needs. We offer a full menu of repair services including flat tire repairs, wheel straightening and replacement, brake and shifting adjustments, and tune-ups. Repairs are not available for purchase online; please bring your bike into the Bessey Hall shop for a free estimate. Here are some common repairs and labor costs below. We can generally repair a flat tire in 10-15 minutes if we’re not slammed and not the last 30 min. of our work day. We replace tubes; we don’t patch them but do sell patches and tubes over the counter if you’d like to save some $$. Our DIY bike repair station outside the Center has everything you need to change a tube and much more. If your brakes aren’t working very well during dry weather they’ll be very dangerous when it gets wet. Get them adjusted sooner than later! If your bike doesn’t shift through your gears like it used to we can get them working right again. If your bike has sat for a long time outside and the chain has seized up or you’ve just put a lot of miles on your bike and it’s skipping when you’re putting power to your pedals then you most likely need a new chain and possibly your freewheel or cassette (the gears on the rear wheel). The 'Pump and Polish' service is perfect for bikes that have been well-maintained and only require a quick check over and minor adjustments. Our staff will be happy to tell you if your bike is a candidate for this service. If you bought your bike online in a box and assembled yourself or from a big-box store and want to make sure your bike is safe to ride, this service is for you. Want to fix it yourself but don't have the tools? Our do-it-yourself bike repair stations are free, available 24 hours a day, and are equipped with a stand, basic tools, and a tire pump. There are multiple stations on campus, including one right outside our shop. 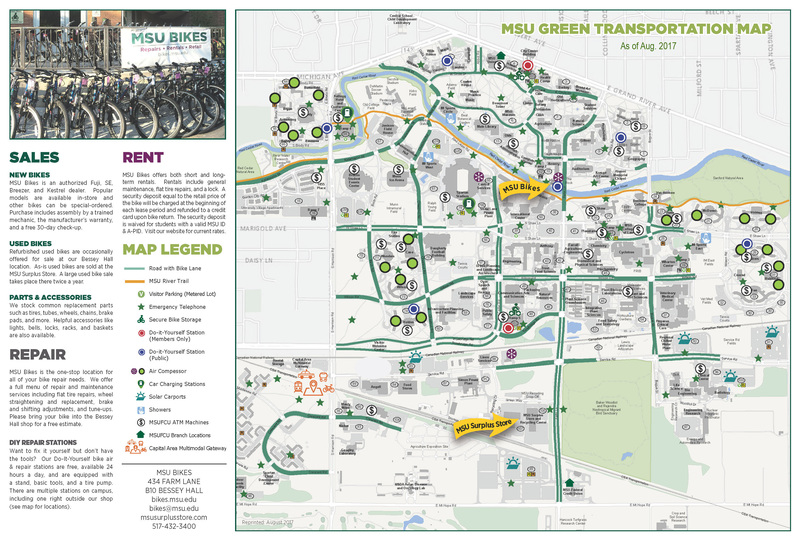 See the MSU Green Transportation Map locations.